Ready to track ad conversions for Facebook but don’t know where to start? You’ve come to the right place. Civil Pixels can track all your important events for one or multiple pixels. You can see a list of all the events and event data our Facebook integration provides in our Facebook pixel events article. Follow this guide once for a single pixel or just go through the same process again for additional pixels. Pick the Facebook Pixel card to start the installation. Now for the hard part (I promise it’s not too hard). 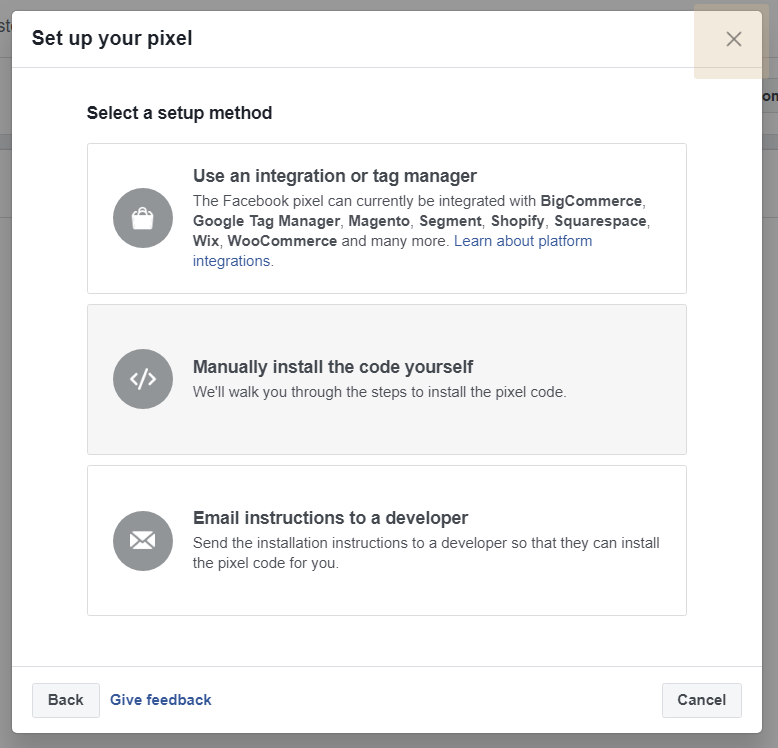 The integration setup will prompt you to enter your Facebook Pixel ID. We’ll need to create a tracking pixel in Facebook and copy the ID that Facebook provides. Head over to your Facebook Events Manager. Under the pixel’s title, look for something that looks like “Pixel ID: 123456789101112”. Copy the numbers only and paste them into Civil Pixels, then move on to step 3! This will bring up a popup asking you to name your pixel. Give it a name and click “Create” (Highlighted in the picture below. When you’re redirected to a new page, you’ll see the following popup. Don’t select any options. Close it. Hit the X on the top right as highlighted below. This will reveal the page below. Under your pixel’s title, you’ll see a series of numbers labeled Pixel ID. It looks like this: “Pixel ID: 123456789101112”. Copy the numbers only and paste them in Civil Pixels. Alright, now all we have to do is pick what we want to track. I’d recommend leaving all of them checked, but feel free to remove events that are not important and that you won’t want to retarget with. Click it and your pixel is ready for you to use! If you’d like to make sure the pixel is working, Facebook has made a Chrome extension to help. The Facebook Pixel Helper will check your pixels for you as you browse your site. Just make sure any ad blocking extensions you have are turned off (they block trackers like the Facebook pixel). Under the “Premade Scripts” section, click on the Facebook Pixel card. You’ll be brought to a summary page for your Pixel. Here, you’ll find the scripts that make up your Facebook Pixel. Each script represents one conversion event or the base code. To toggle a certain event, just enable or disable the corresponding script! You can also edit each script if you want to send different parameters to Facebook. Just click on the script and you can edit the underlying code for it. 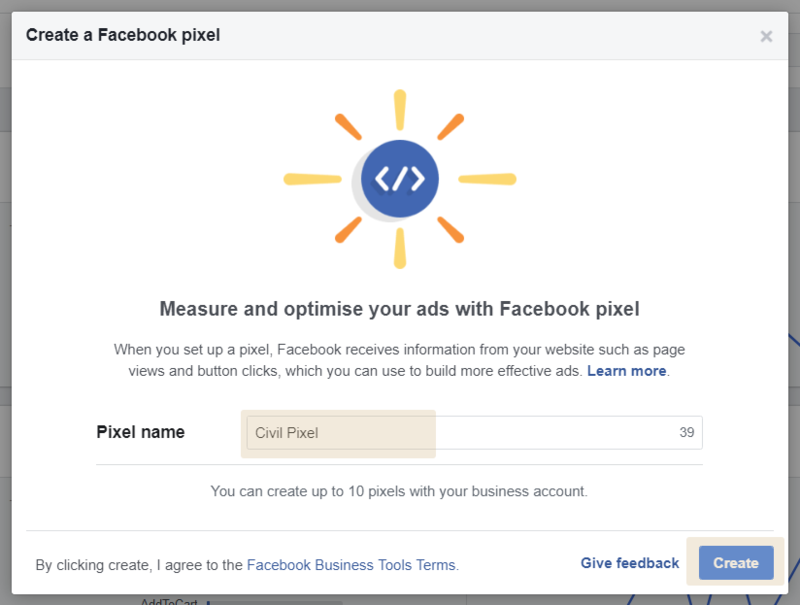 Your Facebook conversion pixel provides data for seeing how your ads perform and for retargeting visitors on Facebook.